As a material wood has many uses, but did you know that it can be used to make fibres for clothing and other textiles? Perhaps surprisingly, it is the raw material of some well known man-made fibres. Regenerated fibres are man-made, or synthetic, fibres created from natural polymers. These polymers are broken down by chemical processes and then reformed into fibres that can be spun and woven to produce fabric. These fibres are bio-based and fall into two categories, depending on their origin. Regenerated protein fibres originate from plant or animal proteins, such as corn, soy and milk, while regenerated cellulose fibres are made from cellulose extracted from wood. Although you may not have heard of regenerated cellulose fibres, you have probably worn clothes made of them and will have heard of some of the product and trademark names. Regenerated cellulose fibres were first developed in France in the late 1800s. In the 1920s the textile industry started calling these fibres "rayon". Other forms of rayon in use today include lyocell, modal and viscose. Cellulose is an important structural component of cell walls in green plants. It is a major component of many plant fibres that are used make clothes and textiles, such as cotton, hemp and flax. But wood isn't a soft fibre like cotton. Turning wood into soft fibres that can be woven to make fabrics is a chemically intensive process. The starting point is wood chip – commonly used woods include spruce, pine and beech – or bamboo pith. Chemicals are used to digest these raw materials and produce a cellulose pulp. The pulp is then further chemically processed, pressed, dried and shredded to produce a dry cellulose compound. This is dissolved to create a solution and then forced through a spinneret – a device that resembles a shower head – to produce strands. These strands are then drawn – stretched – to produce long straight fibres. After washing, these fibres are ready to be made into clothes and textiles. Although they are bio-based, regenerated cellulose fibres are not necessarily environmentally friendly, because of the chemically intensive production process. 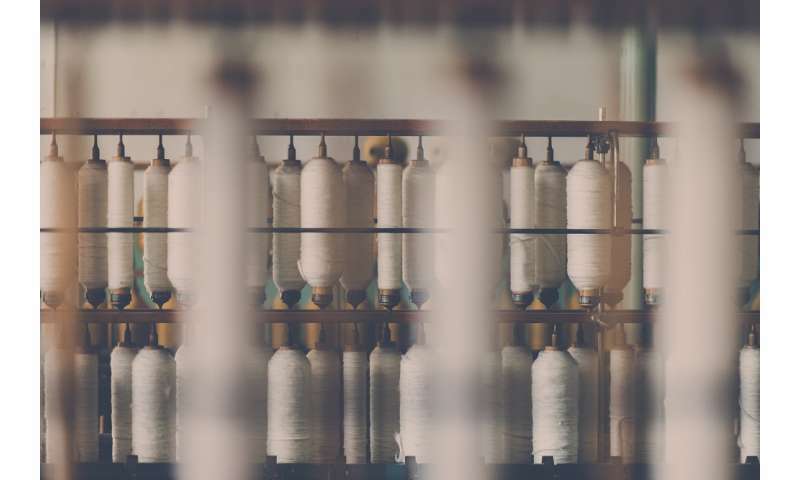 In the past the industry has been accused of damaging the health of workers making the fibres and leaking toxic chemicals into the environment. Some producers of regenerated cellulose fibres now run what is known as a "closed-loop" manufacturing process. This means that the vast majority of the chemicals are collected, recycled and reused. Through the use of such closed-loop processes, different chemicals, technological advances and more responsible disposing of chemicals that cannot be reused, manufacturers hope to reduce the environmental impact of regenerated cellulose fibre production and ensure its future.